Our premium frozen Chef's Pride turkeys come individually gift boxed, tender and juicy, with pop-up timer and complete cooking directions. They are all USDA Grade "A" quality that you can give with pride. Each one of our hams is USDA approved whole-muscle meat, individually gift boxed, and with your choice of half and whole spiral sliced, old fashion semi-boneless and boneless. Loewy Foods can deliver to most parts of the continental USA depending on your quantity and location. Please check with your sales rep to see if we can deliver to your location. Delivery on the Day and Time you Choose. We can deliver to your place of business on the day and time you choose. We ask for a 2-4 hour window. 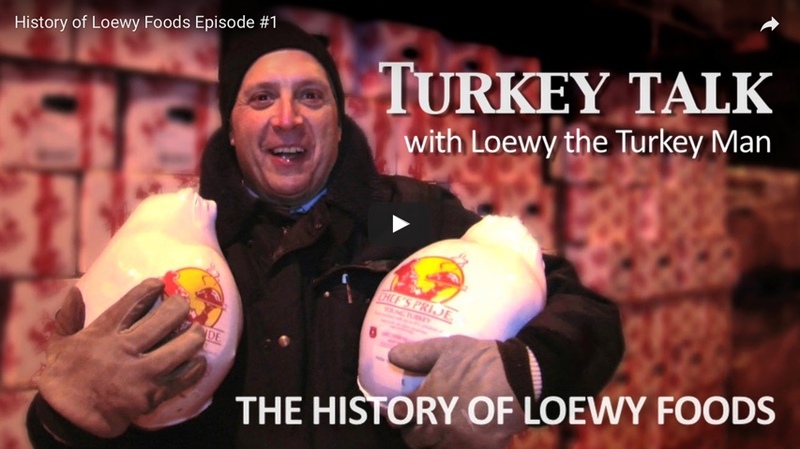 Loewy Foods is a distributor of employee gift turkeys and gift hams to corporations that give them out during the Thanksgiving and Christmas seasons. We pride ourselves on reasonably priced premium gifts, outstanding customer service, and punctual delivery. Does your company have multiple locations around the country? If so, we can help...find out more. Take the worry out of what to give to your employees. We can deliver individually gift-boxed, premium frozen turkeys or hams to employees as a gesture of holiday goodwill that is valued and appreciated far beyond the actual dollar value of your investment. Did you know that gift turkeys and hams to employees is not a tax liability to the corporation or the employee per the IRS? For the cost of a turkey -- show your employees how much you value them. Loewenstein Poultry has been a family business since 1894. Loewy Foods was formed in 1984 by Mark Loewenstein. A 4th generation family-member. 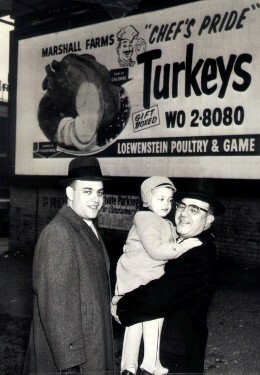 Three generations of Loewensteins in 1960. Marshall (left) Mark (center), and Max (right).